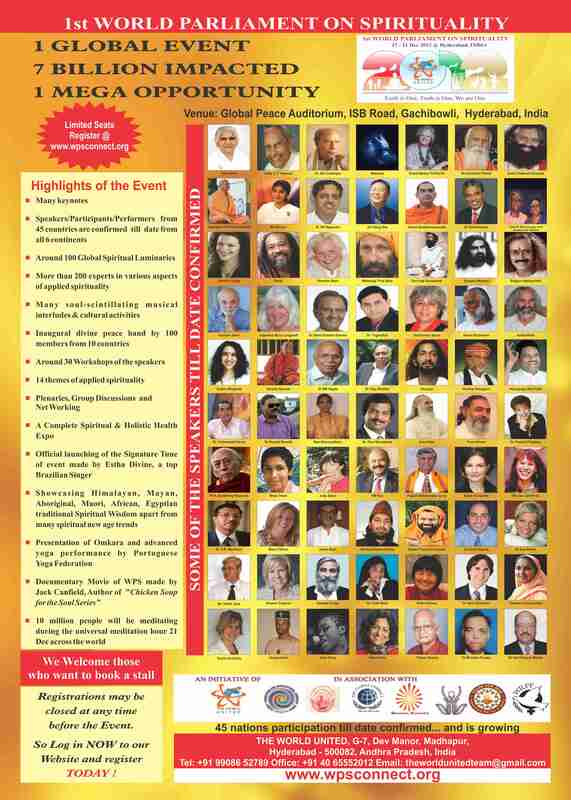 The 1st World Parliament on Spirituality 17th Dec – 21st Dec 2012 at The Global Peace Auditorium, Gachibowli, Hyderabad – India. It was organized by The World United. Please click on the image below to go to the event website and see all its activities. Thanks to all who participated in this wonderful global event. Please see Daywise Schedule of 1st WPS for the program details. 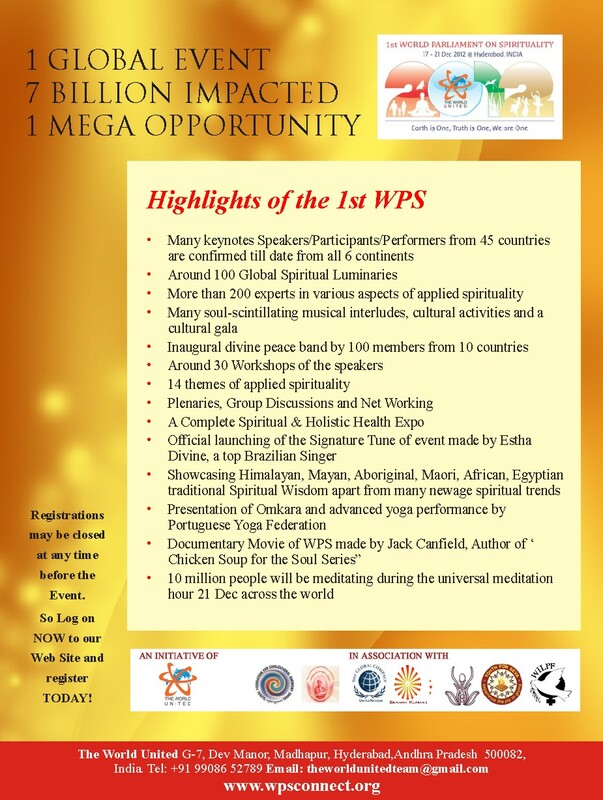 India had the great privilege of hosting The 1st World Parliament on Spirituality that happened from 17th to 21st Dec 2012 at The Global Peace Auditorium, Gachibowli, Hyderabad. The main theme of the Parliament was ‘Earth is One, Truth is One, We are One’. Its Chairperson was none other than Padma Shri Dr.DR Karthikeyan, former CBI Director, DG National Human Rights and its Convenor and Secretary General was Dr.Yugandhar GR, General Surgeon, Spiritual Master and Pioneer in Transformational Medicine. The parliament was a confluence of many of the world’s greatest spiritual masters, as well as thousands of spiritual seekers. The aim of the Parliament is to create Oneness, Peace and Universal Brotherhood in the world by interacting with all enlightened organizations and their members, to share, learn and work together for a Healthy and Happy World. The parliament was organized by THE WORLD UNITED, which is a non-profit foundation based in Hyderabad. The World United serves as a spiritual binding force that connects all spiritual seekers, inspirational leaders, motivators, and trainers of the mind, body and soul, as well as all spiritual groups working across the planet. It was founded by Dr.Yugandhar GR from divine inspiration. Several other organizations also worked in association with The World United to make the Parliament a grand success. Some of its events were telecasted on TV5 News channel and on Youtube. Spirituality, Meditation, Enlightenment, Kundalini Awakening, Miracles, Chakra Energy, Spiritual Transformation, Personal and Planetary Transformation, Channelled Messages from Angelic Beings, Wisdom of various Spiritual Cultures of the World, Traditional Spiritual Schools, Star Wisdom and UFOlogy. Spirituality and Health, Spirituality and Education, Spirituality and Good Governance & Politics, Spirituality and Women’s Empowerment, Spirituality and Arts and Culture, Spirituality and Youth Empowerment, Spirituality and Management, Spirituality and Environment, Spirituality and Disability Management, Spirituality and Science and Technology and Spirituality and Inter-Faith Unity. Around 100 global spiritual luminaries and over 200 experts from various fields of Applied Spirituality from over 50 countries spoke at the parliament. The speakers did not represent any religion, but spoke of Spirituality being the origin and root of every religion. This 5-day event ended with a 1 hour Global Meditation for all of Humanity from 5pm to 6pm IST on 21st Dec 2012 that was streamed worldwide. This meditation was designed to assist Humanity in leaping to its next phase of evolutionary consciousness. “In this 21st century of the spiritual and scientific revolution, our understanding of nature, ourselves and the universe is expanding in all directions. The social, cultural and spiritual implications of this upheaval are incalculable. At the same time, high technology based media are also in a period of dramatic development, enabling us to widely share this newly dawning consciousness with a previously undreamt of degree of verisimilitude. Our planetary civilization is in the later stages of becoming a wholly intercommunicating organism. Advances in visual resolution, interactivity and virtual reality make it possible to place the joystick of exploration in every hand, to open the galaxies, the atom and the cell for personal introspection, thereby helping one brush aside old and limiting beliefs in order to have a deeper view of the unfolding truth. We are a team of spiritual thinkers, writers, trainers, researchers, religious gurus, swamis, engineers, entrepreneurs, architects, doctors, spiritual scientists, educators and artists, who with a growing list of global partners across society, seek to address the disconnect between various belief systems in order to reach for the deeper underlying truths instead. This platform is created to bring forth isolated and disconnected knowledge sources, so that we can deliberate on the subject matter of “What is next for us as Humans” on the planetary evolutionary process. It has often been said in the past that India is the secret spiritual capital of the world. This event seems to be the evidence that this reality is coming to pass. This event was a great opportunity for people on the path of Spirituality and self-mastery, to understand various holistic and spiritual paths and to get an exposure to the teachings of various masters in the fields of Spirituality, Self-Transformation and Wellness. The 150 member Falun Dafa band (practitioners of Falun Gong) from various countries, playing at the opening ceremony. The Falun Dafa band playing on the main stage. Distinguished Spiritual Luminaries along with Dr.Yughandar – The Secretary of The World United (standing on extreme left), Padma Shree Dr.Karthikeyan – Convener of the 1st World Parliament on Spirituality (standing on left). Estha Divine – Princess of Cameroon, singing ‘The World United’ theme song along with some of the Spiritual Luminaries. Our group that attended the 1st WPS. From left, Shivani Thakur, Latika Wellness-Coordinator, Neha P-Sibadkar,Darryl D’Souza, Angel Annu and Pilar Ferrer. Delivering my talk talk on “Developing new levels of Physical, Mental and Spiritual capability to bring in The Age of Aquarius”. My insights on ‘unfolding the blueprint of the Aquarian Beings that we are evolving into’. Receiving thanks after delivering our talks on ‘The role of youth in the global spiritual upliftment’. Speaking in the panel discussion on ‘Science and Spirituality’. For a deeper understanding of the message I gave here, please read the topic ‘Science & Spirituality’ in this website. Addressing ‘The World United Council’ on the way forward, through the World United University, The World United Online Portal and yearly Pre-Parliaments. Being felicitated by the chairperson of the 1st World Parliament on Spirituality, Padma Shri Dr.Kaarthikeyan, secretary of The World United Dr.Yugandhar and renowned spiritual healer Master Zhi Gang Sha for my involvement and contribution towards The 1st World Parliament on Spirituality. With our group just after the felicitation event. With my SunYoga teacher Umasankar Sunyogi. Solar Dynasty beings greet you! Kirtan and Yoga group from Portugal performing. Indian Bharat Natyam dancers performing. A divine luminous orb dances (in center of pic) along. You can also see another two orbs if you look properly. 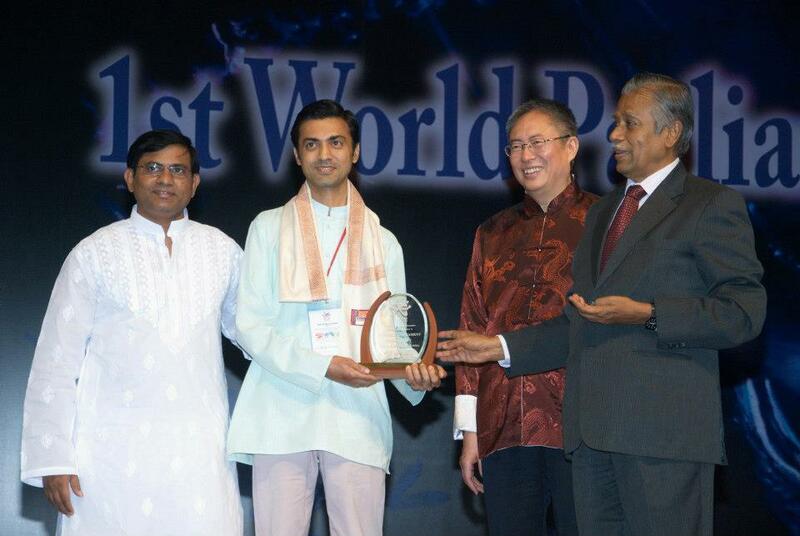 The award I received for my involvement and contribution towards The 1st World Parliament on Spirituality. Many thanks to 1st WPS council and The World United for their appreciation. The Meditation Pyramid in Hyderabad. It is supposed to be the world’s 2nd largest pyramid… only after The Pyramid of Giza! Wonderful !! Thank you Darryl. I will surely be there with you. God Bless. That’s great Latika! Light, Love and Peace be with you. I don’t think I’ll be able to come to Hyderabad, but I wish this wonderful event all the best !! Thank you for your wishes Mum. Love n Hugs!! Wonderful Premanandam! Will be happy to meet you there. God Bless. Thank you so much Dear Dear Darryl ! for taking me and all the rest of us to the 1st WPS. I for sure had the time of my life and things are looking so good ahead. I feel blessed to have met and heard so many spiritual luminaries and I’m sure this event is making my life take a turn for the better. Congratulations to you on receiving an award for your talks and contributions to this great event. God Bless You… Always. Much Love, Annu. Dear Darryl, Thanks so very much for the wonderful time that you showed me along with all the other lovely ladies that accompanied us to the Spiritual Parliament. It was simply the best time of my life and I am so happy that I trusted you to book me into this event. As you know, I was in such joy all throughout the 5 days. I even enjoyed our sight seeing very much and also the wonderful company of our dear friends Annu, Shivani, Neha, Latika and new friend Tushar. I will surely come for the next Parliament too… please keep me informed. Also keep me updated about your projects in The World United. Thank You! Hugs & Kisses, Pilar. Dear Pilar, It was wonderful having you along with us. I’m happy that you had a wonderful time and that you will carry many good memories and pictures of this event to Spain and France. Do spread the news of the work we are doing here and bring more friends the next time you come… bring our dear Anna Bayes for sure! Hugs & Kisses, Darryl.